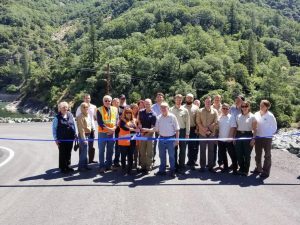 On June 13, 2017, PG&E and a group of stakeholders including CSPA dedicated the Rock Creek Bench recreation access and parking area just downstream of Rock Creek Dam on the North Fork Feather River. The facility will provide safe access to the river for whitewater boaters, who previously had to park on the far side of the highway that runs next to the river and cross the highway with kayaks and gear. Because PG&E has now agreed to keep the area open during the summer recreation season, the facility will also provide parking for anglers and access to a long riffle and other fishy-looking water that was previously very cumbersome to reach. PG&E has committed to maintaining a portable restroom at the site while it is open. The Rock Creek Bench was the result of a multi-party negotiation that took place within the Ecological Resources Committee for PG&E’s Rock Creek – Cresta Hydroelectric Project. The Committee implements the settlement agreement that CSPA and others reached in the early 2000’s and that the Federal Energy Regulatory Commission incorporated into its license for the Project. CSPA’s Chris Shutes gave a brief talk at the dedication of the facility, which describes the genesis of the facility and the negotiation. The text of that talk is here. In the high flows of Water Year 2017, general fishing access to the North Fork Feather River has substantially improved. The high flows blew out much of the willows, alders and other vegetation along the stream banks that had previously made fishing difficult. This should be a good year for angling on the North Fork Feather.